Since the founding of Saint Joseph's Hospital in 1880, the hospital has been led by 16 Sisters of Mercy who have served as the CEO/Administrator. From the founding by Sister Mary Cecilia Carroll to Sister Mary Brian Anderson, these visionaries served the community with an unwavering commitment to the Mercy Mission and have guided the hospital through many changes during its long history. Some of these changes include the facility and program expansion at Saint Joseph’s downtown location, desegregation and the move to north Atlanta to meet the growing needs of the community. Sister Mary Brian Anderson, the last Sister of Mercy to serve as the president and administrator of Saint Joseph’s, was the driving force behind the hospital’s expansion and its move to the current location. 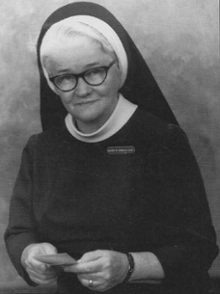 During this pivotal era, Sister Brian oversaw plans for construction, solicited donations, wielded a shovel during the groundbreaking, and assisted with the transportation of patients to the new facility on March 18, 1978. Sister Brian received her R.N. from Saint Joseph’s School of Nursing, her B.S. in nursing at Mount St. Agnes College in Baltimore, and her graduate degree in hospital administration at St. Louis University in MO. In addition to serving as the administrator/CEO of Saint Joseph’s, Sister Brian was also a member of Saint Joseph’s Health System and at the time of her death in 2011 was an emeritus member of the board of trustees.